Herman Melville is the author of a volume of verses published by Harper & Brothers. The verses contain a good deal of fair writing, some spirited lines, and a great deal of commonplace with an addendum in the shape of a not very creditable essay on politics. Untitled and unsigned, this poem appeared in the Troy Sentinel on February 20, 1824, almost two months after the anonymous first printing of Moore's "Account of A Visit from St. Nicholas" on December 23, 1823. The two poems may have been composed around the same time. There was in fact a snowstorm in New York City on Saturday, December 21, 1822, a few days before Christmas. The speaker in both poems is a father with children (asleep in "Visit" while sugarplum visions "danc'd in their heads"; awake in "Lines" while snowflakes "dance upon the air"). Significant verbal parallels with "Visit" include the shared beds/heads rhyme, the simile with the trigram "as the snow," as well as forms of the words dance, vision, and winter's. Presumably the person or persons (Harriet Butler and Sarah Sackett, according to different reports) who furnished editor Orville L. Holley with a copy of Moore's "Visit from St. Nicholas" also provided Moore's lovely little snow poem. In the 1844 volume Poems by Clement C. Moore it appears on pages 80-82 under the title, "Lines / Written after a Snow-Storm." So lovely and so fair. Shake down the feathery snows. So lovely [1844: lightly] and so fair. Shake down the feathery [1844: feath'ry] snows. --Clement C. Moore, Poems (New York: Bartlett & Welford, 1844), 80-82. We know not to whom we are indebted for the following description of that unwearied patron of children—that homely, but delightful personification of parental kindness—SANTE CLAUS, his costume and his equipage, as he goes about visiting the fire-sides of this happy land, laden with Christmas bounties; but, from whomsoever it may have come, we give thanks for it. There is, to our apprehension, a spirit of cordial goodness in it, a playfulness of fancy, and a benevolent alacrity to enter into the feelings and promote the simple pleasures of children, which are altogether charming. We hope our little patrons, both lads and lasses, will accept it as proof of our unfeigned good will toward them—as a token of our warmest wish that they may have many a merry Christmas; that they may long retain their beautiful relish for those unbought, homebred joys, which derive their flavor from filial piety and fraternal love, and which they may be assured are the least alloyed that time can furnish them; and that they may never part with that simplicity of character, which is their own fairest ornament, and for the sake of which they have been pronounced, by authority which one can gainsay, the types of such as shall inherit the kingdom of heaven. Santa Claus.--A few days since, the Editors of the N. Y. 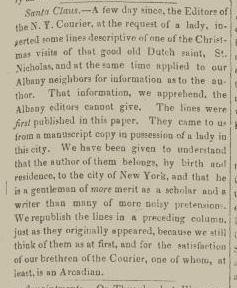 Courier, at the request of a lady, inserted some lines descriptive of one of the Christmas visits of that good old Dutch saint, St. Nicholas, and at the same time applied to our Albany neighbors for information as to the author. That information, we apprehend, the Albany editors cannot give. The lines were first published in this paper. They came to us from a manuscript copy in possession of a lady in this city. We have been given to understand that the author of them belongs, by birth and residence, to the city of New York, and that he is a gentleman of more merit as a scholar and a writer than many of more noisy pretensions. We republish the lines in a preceding column, just as they originally appeared, because we still think of them as at first, and for the satisfaction of our brethren of the Courier, one of whom, at least, is an Arcadian. In the Troy Library copy, the printed text of "A Visit from St. Nicholas" on page 2 is gone; somebody carefully clipped the poem from this issue (January 20, 1829) of the Troy Sentinel. 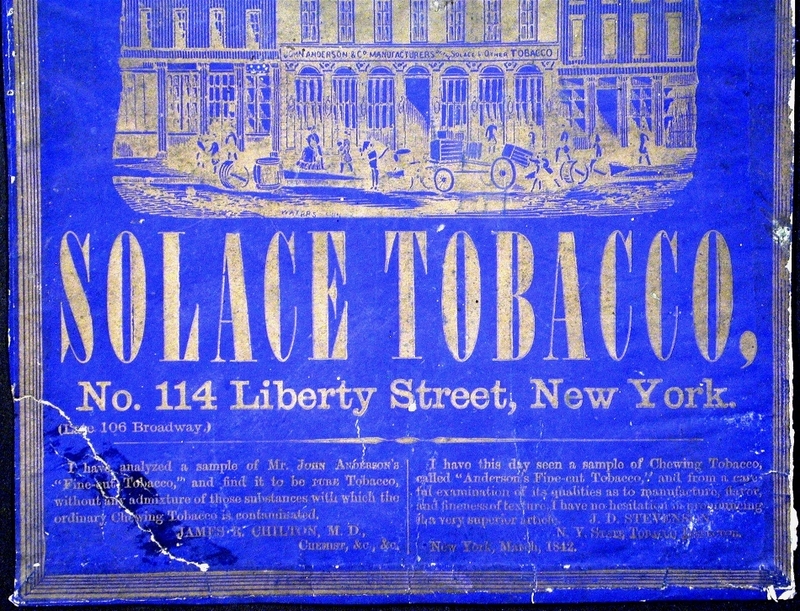 --found at NYS Historic Newspapers. This item was reprinted the following week in the Auburn Journal and Advertiser on Wednesday, January 4, 1837. Selections from the American Poets, edited by William Cullen Bryant, reprints "A Visit from St Nicholas" under the name of "Clement C. Moore." Moore, evidently prompted by the false attribution recently published in the influential National Intelligencer, must have asked Tuttle about the circumstances of the poem's first publication in Troy. Presumably Moore wondered if Wood or anyone else had ever claimed authorship. Norman Tuttle's reply to Clement Clarke Moore is dated February 26, 1844 (Museum of the City of New York. 54.331.17b). Tuttle states he eventually learned of Moore's authorship and does not mention any other claim. Possibly without waiting to hear back from Tuttle, Moore then directly and unambiguously asserted his claim to authorship in a published letter to the editor of The New York American. Re-asserted, rather, considering Moore's prior submission of "A Visit from St. Nicholas" aka The Night Before Christmas with three other poems for publication in the 1837 New-York Book of Poetry. Dated February 27, 1844, Moore's letter to Charles King appeared in the American on March 1, 1844. Clement C. Moore on the authorship of "A Visit from St. Nicholas"
LINES TO ST. NICHOLAS.--The following note from our friend C. C. Moore, the author of those lines which every child among us delights to hear, about Christmas, and which parents with not less delight recite, brings to our notice, one of the boldest acts of plagiarism of which we have any recollection. We ask the National Intelligencer to have the goodness to insert Mr. Moore's note--and if possible to elucidate the mistake, if such it be, or fraud attempted in respect of such well known lines. Dear Sir--My attention was, a few days ago, directed to the following communication, which appears in the National Intelligencer of the 25th of December last. 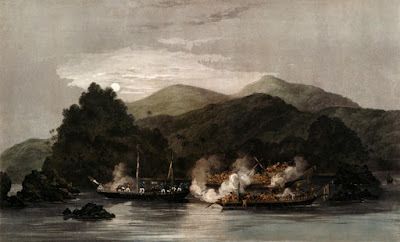 The enclosed lines were written by Joseph Wood, artist, for the National Intelligencer, and published in that paper in 1827 or 1828, as you may perceive from your files. By republishing them, as the composition of Mr. Wood you will gratify one who has now few sources of pleasure left. Perhaps you may comply with this request, if it be only for 'auld lang syne.'" "The tortoise is both black and bright," but one notes for what it is worth the entertaining implication that the bright side is not the right side; to see it you have to turn your tortoise upside down, and to maintain it you must keep him upside down. The Piazza Tales by Herman Melville via Google Books. 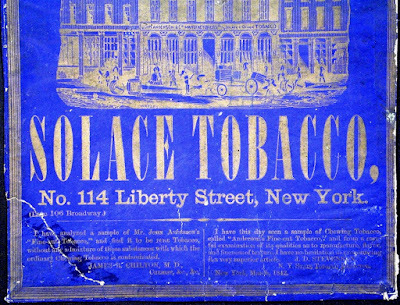 Chewing tobacco, the brand Herman Melville bought for 10 cents in Louisville, Kentucky. Melville was on the way to Cincinnati, Ohio where he lectured on Statues in Rome (February 2, 1858 in Smith and Nixon's Hall) for the Young Men's Mercantile Library Association. The entry "Solace — (Anderson's) 10" appears in Melville's Memoranda of Travel Expenses 1857-58, as transcribed by Merton M. Sealts, Jr. in Melville as Lecturer (Harvard University Press, 1957), page 192. Can art, not life, make the ideal?